As part of the Tandem project Open State Foundation and Italian based Virtutim are exploring the possibilities for Open 3D Culture. For our background research we visited a variety of Dutch archaeological depots and the Dutch Cultural Heritage Inspectorate. We are sharing our exciting findings on both the possibilities, the organisational readiness of governments and the appropriate legislation. A 3D model is a digital file that can be viewed, possibly changed or even printed in 3D. This means that the object of interested represented in the file, can be viewed from different perspectives such as angle and distance. A 3D object can be made with either photography, a technique called photogrammetry, or by using scanners. For our project, we used photogrammetry to produce 3D models, because this method is less time-consuming, cheaper and the equipment is more portable. These resulting 3d models made with quality camera’s can be as precise as up to 0.1 millimeter, also allowing to zoom in to the object beyond what a human can easily perceive. The file format describes at very least a dense point cloud or a polygonal model. This model can be covered with textures, for providing a photorealistic experience when viewing the model. For research and analysis 3d models can be highly effective and more comfortable than actually viewing tens of separate pictures or viewing with the human eye. It is also a preferred option to study sensitive or broken objects. Of course, when digitized, this ‘content’ be shared, allowing use or even re-use from internet. This makes it possible to study objects without having to travel for it. With re-use 3d models can be re-modelled , for instance into a product design, artwork of used from a different context, such as an virtual reality, augmented reality, games, i.e. a 3D digital environment. Of course, you can also print 3d models, in different materials. Archaeology is a very useful domain to apply 3d models. The use can vary from excavation (prospecting underground with ‘ x-rays’ in 3d during a digging, documenting the excavation site), conservation of landscapes, monuments and objects. For instance, there are several projects that work on reconstructing archaeological cultural heritage of Syria. But also think about exhibiting 3D copies of fragile objects in a museum, possible even allowing visitors to touch. Or objects that are temporarily on display somewhere else or undergoing restoration, can be replaced with a 3D printed replica. Teaching and education can be done, either through apps or Virtual Reality. For 95% of European students going to Rome is not a feasible option, but still everybody in Europe learns about the Roman age.. In the Netherlands, whenever someone applies for a building permit, the city assesses (with sometimes advisory of the depots archaeologists) chances of finding archaeological artefacts. If this is the case, together with the building permit (omgevingsvergunning) the permit obliges to hire a professional archaeological excavation company to further study the site. In this report a more detailed assessment is provided, and if archaeological finds are likely, before the building starts the site needs to be surveyed and dig out. The results of this survey and dig are documented (originally in written reports with drawings of the site, photos of the object, later by digital versions delivered through cd rom or dvd or internet. These site survey documents are given to the depots and the city, and the physical objects are brought into the depot. The province will uniquely tag every object and keep it or destroy the object. This prevents finding the same object in different locations twice, messing up the database and causing bad research findings. Destroying the objects is very rare, but could happen when finding 100.000 bricks, that are simply to expensive to store (in a properly regulated environment). Depots register objects in a database, and when possible with an image of the object. You can visit depots, but sometimes only by appointment. Some depots share their database on the internet, and the provinces of North and South Holland publish open data on their websites. The cultural heritage inspector is responsible for monitoring these processes, ensuring quality of archaeology in the Netherlands. During our visits with the archaeological depots of Groningen, Friesland, Drenthe, North Holland and South Holland we constructed several 3D models (download link zipfile 3D-pdfs , license CC0) and had a discussion to found out what purposes they see for 3d models as useful. North Holland combines a depot with a local archaeological museum, that is mostly visited by schools for educational purposes. They see possibilities in education. Possibilities to visit virtual exhibitions online and play educational games, but also use digital installations in the museum that provide immersive experiences on former times. The shared depot of Groningen, Drenthe and Friesland were inspired by the possibilities for changing site documentation, allowing more efficient and higher quality transfer of knowledge that goes beyond regular documentation. Imagine a researcher visiting a virtual excavation site, getting a very precise idea on the location of the virtual objects in relation to each other, allowing research conclusions that would normally be missed. Also they have some worries concerning the loss of heritage, especially in Groningen, where earthquakes due to gas exploitation happen, causing damage in historical buildings and even requires buildings. Some of these houses are bought by the gas company and demolished. With 3d-models of historical farms that might be destroyed because of earthquake damage, this important cultural heritage is preserved for future generations. The Northern provinces are not alone in this line of thought. The province of South Holland shared worries about the state of some of it’s historical windmills and the extensive costs that are needed for maintenance. South Holland has a lot of Windmills and funds are limited. Incidental fires caused by lightning once every now and then destroys or extensively damages windmills. 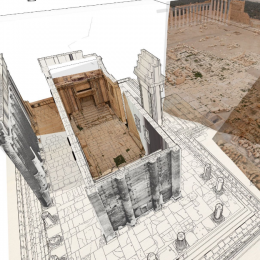 Also they see the opportunity of 3d models as a basis for better documentation of excavation sites. The province of North-Brabant has experimented with drones for photographing the site during several moments of the dig. No 3D models were made from such a site survey yet though. With these possibilities they also asked practical questions on how to proceed. Are there service firms for 3d models, and what is their business model. Are there limitations on, for example the objects to be modelled. Can you model entire excavation sites? What kind of scanners, cameras and other technology do you need? What software is needed to build the models? Can photogrammetry and 3d modelling be learned, and can volunteers be trained to build 3d models? At the office of the Cultural Heritage Inspector we shared our knowledge on 3D models and open data, but more importantly, our findings with the cultural depots. They are interested in the topic from a broader perspective, with the question what innovation will to happen in the field. The other reason is that the possibilities of 3d models and open data might have internal use cases and potential. 3d models are in some case easier and better for (global) research. No need to visit all the depots. concerns on the preservation of 3d models, and/or techniques, in relation to its accessibility. Can we open 3d PDF in 30 years? underwater archaeology; objects out of the water quickly deteriorate, making excavation a less attractive option. Underwater 3d models allow research, without excavating, or getting more details before excavating. Derivate works for commerce & bookshop. The most important question for the Heritage Inspection is: ‘how to use 3d models as part of archaeological process (i.e. defined by law, supervised by government)?’. Should the Heritage Inspection allow 3d models instead of ‘ traditional ‘ documentation? How does this mix with closed software formats (3d-pdf and closed formats from laser scan software), and accessibility in the future? And important: Dutch law does not specify the format of documentation, so legally 3d models can replace more traditional documentation. How does the inspection, and depots work together on this? There are a lot of possibilities with 3d models in archaeology, but it is also time to make concrete steps. Archaeological digital infrastructure should be improved and made ready for opening up and sharing 3D models. Exploring high impact use cases and projects with 3d archaeology should be on top of the archaeological depots innovation lists. We are planning on organizing a small meetup to move ahead with these topics. If you would like to be kept informed on this topic , contribute or think this is important, than do contact us through this form.